NOTE: Another in a series of projects completed for a new local newspaper publication. To read the first post in the series click here. CRACKED POT JACKPOT: This project was born from a tragedy-to-triumph type situation. I’d purchased this amazing cast iron cauldron months ago from a local antique shop. Having seen similar pieces with big tickets attached to them, this one was a really good deal; too heavy for a single person to hoist, Paul and the seller teamed up loading it into back of the car. Tragedy struck once we arrived home. Having backed the car inside the fence, and thinking that such a massive vessel was indestructible, Paul pushed it out of the hatch and onto the gravel — whereupon it broke with a dull crack! To say I was not happy with this turn of events is to put it exceedingly mildly. I gathered up the fragments and we set the now-useless piece aside; I didn’t even want to look at it. Fast forward; I see a set of rusted steel steps for sale at Vintique Alley in Riverside and have to have them. Also a great deal at $75, I buy them and we get them home without incident. Next day the wheels start turning in my head: Would the cauldron fit on the top step? I measure and determine that although it will be close, its three little feet will just fit. So, when Stephen Penn and company arrive to to stack the planters featured in the previous post, I have them complete this task as well (hey, I have to optimize my visits by helpful, local strong men!). First, I have them position a very thick, tempered glass table top to act as a level base for the steps; I like the reflective quality it provides. The steps are next, followed by the cauldron. All the pieces fit perfectly and the whole looks amazing; scale-wise it is perfect for the DG-covered berm. The next day I begin to wonder whether there’s something I could plant in it that would look like falling water … it would not only look cool but it would also lend function to the otherwise useless vessel. Sadly, nothing springs to mind … until the day we go to Fallbrook’s Serra Gardens and I see the solution: Dischidia nummularia! Also known as “string of nickels”, it’s an epiphyte (a non-parasitic plant that grows on other plants) known for dangling from trees in its native New Guinea and Australia, and requires very little water. It also possesses waxy, disc-like leaves that, while coursing along its sturdy vines, will approximate the twisting and tumbling of falling water … or a jackpot of nickels, if you like. Along with that, grabby little tendrils curl along the vines, reaching out to other plants, trellises or fences. I’d forgotten about this amazing plant, although I’ve had examples in that past and enjoyed its hardy qualities and attractive looks; I love how the “coins” catch the light. Now in its new home, I can’t wait to see it trail off along the ground and engage with its surroundings. 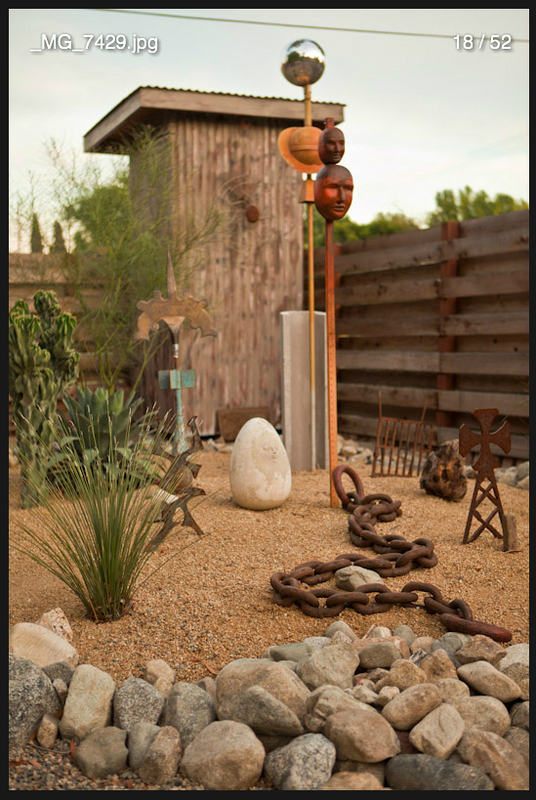 This arrangement, along with the stacked pots in the previous post, demonstrates how my approach to the Rancho’s garden has changed. Rather than having many small elements (plants, rocks, decorative items, etc.) clustered in one area as in the past (see inset), I’m favoring larger, more art installation-like solutions to spaces. Of course, surrealism and humor — Rancho mainstays —are at play. Both the stacked industrial “lilies” and manhole cover “pads” of the previous post, and the cauldron overflowing with succulent “water” in this one, show me playing with and subverting traditional garden decoration through the use of unusual materials. People have been stopping by out of the blue again lately for some reason, to ask about plants, to see the garden or just to be complimentary. It’s always fun to witness their surprise at my endeavors. Again, I’m very fortunate to have many hands-on supporters willing to assist me in achieving these projects. Thanks again, guys! 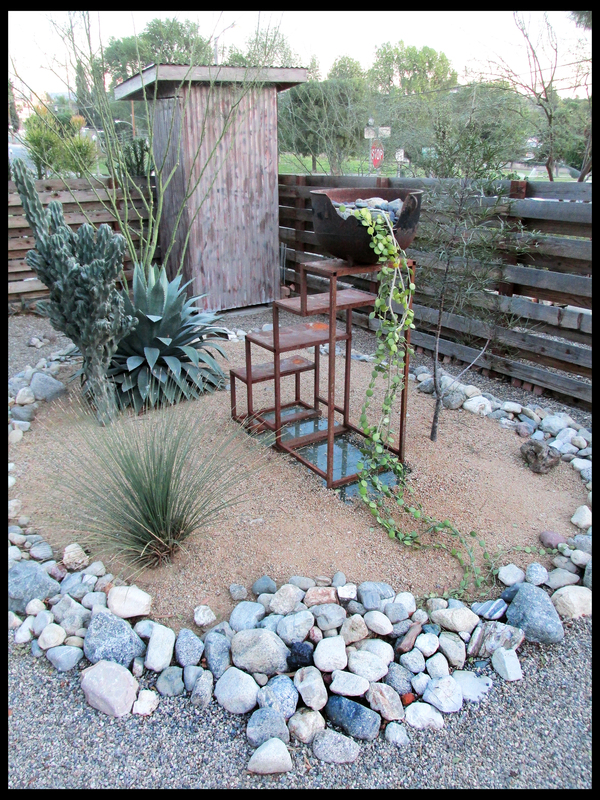 Your creative invocation of water in your dry garden is inspiring! Hey, the California drought is real! I LOVE this one !!!! It’s a good thing that Paul pushed the cauldron out and it broke. It looks like a dry pond with the rocks as a border, and the water fall of plants. LOVE IT. It seems that every week you amaze us with your ideas. Bravo!!! Reuben, this new work is stunning. I covet those steel steps, but unlike you would clutter and obscure them with lots of pots, always a weakness with me. I love your graphic instincts. So glad you said yes to this mysterious Inland Empire impresario who obviously has impeccable taste. Hooray for the team of willing strong men too! I’m so glad that I finally thought to catch up with your blog! I hadn’t thought about how pictures can show so differently that what I saw in person. Of course it’s probably cause we’re looking at everything thru your eyes. And seeing your place all dressed in lights at night is such another view. What would we do without our friends who help us with our little projects? I certainly don’t want to try. It’s so fun to watch your place grow in all it’s glory!